The election cycle is ramping up: Walk outside and you’ll see yard signs and door hangers. Check your mail, and you’ll find a postcard from a local candidate. Political advertising is everywhere in our neighborhoods and local businesses, and it’s all vying for attention. How do you plan to stand out this season? According to the Direct Marketing Association, direct mail pieces create up to 80 percent more return on your investment than their digital counterparts, which makes direct mail ideal for raising funds or promoting an upcoming event. 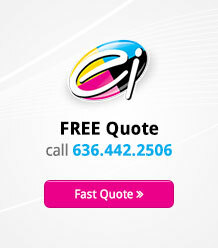 Direct mail can include many different kinds of materials. Each has marked advantages, so deciding on which type of direct-mail piece works best for your campaign will depend on a number of factors, including budget, whether your primary need is to introduce yourself to your constituents, or better inform them about your candidacy, and what stages of campaigning you’re currently in. Postcards are simple but powerful. They’re eye-catching and serve a dual purpose: They are an effective way to visually introduce yourself and your brand on the front, while using the back to talk about your positions and causes more in depth. With postcards, you can also take advantage of EDDM, an amenity provided by the U.S. Postal Service that allows you to send your direct mail campaign to every household in a specific neighborhood for a reduced price. Personalized letters and letterheads are crucial in the early stages of the campaign, as they give you the opportunity to outline your campaign platform and introduce yourself to your constituents for the first time. Brochures are useful for discussing your campaign and your causes in detail—just as with letters—but brochures can be designed so that they are visually appealing and accessible. This makes them incredibly effective at giving voters the information they need in a convenient and easily readable format. Of course, any political candidate knows that engaging in direct mail is simply not enough when running for office. Especially in local campaigns—and even in large-scale campaigns—rallying your loyal supporters to help you spread the word about your candidacy lends your campaign vital credibility. The most effective grassroots efforts begin with yard signs. 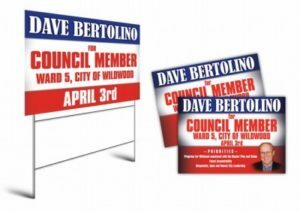 An attractive sign placed in a yard at a busy intersection in your district significantly improves your name recognition, which makes any of your following efforts—direct mail or otherwise—more powerful. You won’t convince many voters to lean your way simply by reaching out to them only once. But if they see a yard sign that’s followed up by a letter explaining your stance on popular efforts, and perhaps an event invitation where your constituents have the chance to meet you, your chance of gaining votes increases significantly.